The child welfare system has embraced permanency planning for decades, and increasing access to financial, social, medical, and educational resources for formal and informal kinship foster care providers benefits both the children and the system. Ask people what the term “caregiver” means, and the answer is likely to be a relative who provides care to elders and/or people with disabilities in their home. Social workers and the general public have recognized this population and their need for services and support as they fulfill responsibilities for relatives who no longer can care for themselves or who need some type of assistance with activities of daily living. Much professional literature and program development has emerged on the needs of these caregivers and deservedly so. However, there is another group of caregivers who often are not included in the general category of caregivers: kinship caregivers in the foster care system. These caregivers have taken a relative’s child(ren) into their homes to provide care in situations where the biological parent(s) cannot. Situations such as parental drug abuse, incarceration, abandonment, and parental incompetence, among others, lead to kinship foster care. As defined by the Child Welfare League of America (2000), kinship care is the full-time care, nurturing, and protection of children by relatives or any adult who has a kinship bond with the children. There are two types of kinship foster care providers: those who are formally involved with the child welfare system and those who provide such care on an informal basis. The child welfare system prefers kinship foster care providers, and the system has relied on them for more than two decades. Kinship caregivers include grandparents, aunts, uncles, siblings of the children requiring care, cousins and, in some cases, nonblood “relatives,” in which someone not blood related is considered a family member. In 2011, census data showed that 2.8 million (4%) children lived with grandparent caregivers (KIDS COUNT, 2011). As the numbers of kinship foster care providers increased throughout the 1990s and into the 2000s, researchers examined kinship foster care more closely and reported in the literature. A consistent finding among researchers was the need for substantial support and assistance for kinship caregivers. In response to the continuing preference for kinship foster care within the child welfare system and the growing evidence of the needs of kinship foster care providers, the Fostering Connections to Success and Increasing Adoptions Act was signed into law in 2008. This law promotes permanent families for children in foster care “through relative guardianship and adoption and improving education and health care” (Children’s Defense Fund, 2010). Permanency planning policy within the child welfare system was formally embraced in 1980 as a result of the high numbers of children who were spending their entire lives in foster care, frequently moving from home to home, and eventually aging out of the system, often ill prepared to forge successful and independent futures. Recognition of undesirable outcomes of foster care resulted in the passage of the Adoption Assistance and Child Welfare Act of 1980, which identified permanency as the goal for all children and youths requiring out-of-home placement. Family preservation emerged as a way to prevent foster care, with the goals of providing services to families in crisis to avoid the need for out-of-home placement, protecting children from harm, improving family functioning, and preventing child abuse and neglect. Family preservation achieved national policy status in 1993 with the passage of the Omnibus Budget Reconciliation Act, which included a family preservation and support program. Subsequent child welfare legislation in 1997, the Adoption and Safe Families Act, and the 2003 reauthorization of the Child Abuse Prevention and Treatment Act continued the emphasis on family preservation. While family preservation policy has evolved, the number of available licensed foster homes has not kept pace with the need for foster care across the country. Many people who become foster care providers do not remain so for an extended period of time. It has been reported that foster care agencies experience a loss between 30% and 50% of foster families yearly (Christenson & McMurtry, 2009). The declining number of available licensed foster care providers has supported the growth of both formal and informal kinship foster care providers in the child welfare system. The Fostering Connections to Success and Increasing Adoptions Act of 2008 requires state child welfare agencies to provide notice to grandparents and other adult relatives when a child needs foster care. Specialized services for locating relatives who may be far removed geographically and socially from the child needing care are used in some instances. Kinship foster care has grown dramatically as a result of these policies and procedures, concomitantly increasing the workload of child welfare staff. The growth of both formal and informal kinship foster care has led to closer examination of all aspects of kinship foster care. Who are these providers? Are they receiving sufficient support from child welfare agencies and/or other community agencies? Do they fulfill the goal of a permanent home? Do they meet or exceed the same rigorous standards for licensing as nonkinship foster care providers? Do the children in their care fare as well as or better than those in nonkinship foster care? These questions and related issues have been researched to varying degrees with the past decades’ proliferation of kinship foster care homes. Recent research conducted with formal, court-approved kinship foster care providers indicates that these homes tended to be poor and headed by older, single, and unemployed individuals (Sakai, Lin, & Flores, 2011). They received significantly fewer support services and were less likely to have input on service plans than licensed foster care providers. Higher risks for adolescent pregnancy and substance abuse also were found among youths in formal kinship care. However, formal kinship foster care homes provided greater placement stability for children compared with licensed foster homes. Outcomes indicated that children in formal kinship care also had lower levels of behavioral problems and social skills impairments. While these research results are informative, it is important to note that this study included only court-involved kinship homes and contained certain limitations. The question of whether kinship foster homes meet the same standards and requirements as licensed foster homes raises a critical issue within kinship foster care. A large number of kinship foster homes are not formally connected to the child welfare system. Those relatives providing informal kinship foster care often are less supported compared with those providing formal foster care in which the child welfare agency and/or the courts are involved. Efforts to engage relative caregivers in the formal child welfare system confront myriad cultural, social, and familial obstacles, resulting in the preference for informal status among many kinship caregivers. The vast majority of kinship foster care providers are grandparents, with 2.5 million raising grandchildren. It is estimated that between 125,000 and 150,000 children are in formal, court-involved, and/or child welfare agency-sponsored kinship foster care (Sakai et al; Raphel, 2008). Clearly, the majority of kinship caregivers are in the informal category. Most research that has been done on kinship foster care providers has focused on grandparents. Grandparents tend to be less prepared to assume child care responsibilities than licensed foster care parents because it is often a crisis that precipitates the need for grandparent care, while formal foster care parents have been prepared through training and education. A large number of studies have found that both formal and informal kinship caregivers are “more likely to be female, African American, older, single, less educated, unemployed, and had lower socioeconomic status” compared with licensed foster care providers (Strozier & Krisman, 2007). The U.S. Department of Health and Human Services in a 2000 report to the Congress on Kinship Foster Care noted that grandparents caring for grandchildren reported “more limitations of daily activities, increased depression, lower levels of marital satisfaction, and poorer health” compared with grandparents who were not caring for grandchildren. It is apparent that kinship caregivers assume a large burden when they become kinship foster care providers. Yet it also is widely found that both formal and informal kinship caregivers tend to receive less financial, educational, emotional, and supportive assistance than do nonrelative, licensed foster parents. Preference for kinship caregivers for children needing foster care has not been accompanied by sufficient increases in services that would help these families meet the child welfare system’s goals of child safety, supporting families, and permanence for children. This realization, along with research documenting the unmet needs of kinship providers, was instrumental in the passage of the 2008 Fostering Connections legislation. While this legislation responds to some of the needs of kinship foster care providers, it leaves many issues and barriers unresolved. Primary among these issues is the requirement for informal kinship caregivers to become formal in order to access the highest levels of benefits and services. On the surface, this may seem benign yet, in reality, it is a major obstacle. There are many reasons why grandparents and other relative caregivers avoid a formal relationship with the child welfare system and the availability of increased benefits may not be a strong enough reason to overcome their reticence. Prior involvement with the child welfare system and family members who may have criminal records, poor housing, and attitudes of child welfare workers who may question placement in homes where the “unfit” parent was raised, all may contribute to the preference for avoidance of formal status on the part of some informal kinship foster parents (Lorkovich, Piccola, Groza, Brindo, & Marks, 2004). Kinship caregivers who prefer to remain as informal foster care providers avoid the need to engage with the child welfare system toward the policy goal of permanence for the children in their care. Adoption is considered the primary goal of permanency planning, but kinship caregivers may reject adoption. Court proceedings that terminate parental rights to free children for adoption often are resisted. For grandparents, this would mean irreversible actions against their own children, destroying any hope of their child reassuming parental responsibility. Family dynamics are altered, and relationships may suffer or be severed. Options to achieve permanence rather than adoption may be more satisfactory to kinship care providers. Legal custody and legal guardianship may be viable options in some states, providing kinship caregivers with access to some services. A legal status, or de facto custodian guardianship, has been suggested as one way to confer legal status on kinship care providers, enabling them to access some services (Gibson & Singh, 2010). The Fostering Connections to Success and Increasing Adoptions Act recognizes the problems inherent in kinship care providers’ informal status and includes efforts to address these problems. This act provides states with the option of guardianship assistance payments for children in kinship care when relatives are committed to caring for the children on a permanent basis, when returning home or adoption are not viable and when children would otherwise remain in foster care until aging out (Children’s Defense Fund). In addition, the act enables states to waive nonsafety licensing standards on a case-by-case basis to increase the number of informal kinship foster care providers who become formal providers. Kinship foster care benefits children in many ways. Familiar caregivers, often in a familiar environment, can reduce trauma associated with out-of-home care. Connections to extended family and maintaining sibling relationships promote stability and may contribute to positive self-esteem and healthy development. At the same time, kinship foster care benefits the child welfare system by providing a pool of resources for out-of-home care to augment the shrinking number of licensed nonkinship foster care providers. Increasing access to financial, social, medical, and educational resources for informal kinship foster care providers is in the best interests of both the children in care and the child welfare system. Passage of the Fostering Connections act has resulted in various services and programs aimed at informal kinship foster care providers across the country. Concerns remain, however, especially for those informal kinship care providers who choose to remain out of the formal child welfare system. In March 2011, a National Kinship Summit was held, sponsored by the Child Welfare League of America (CWLA), the National Kinship Care Advisory Committee, and the National Committee of Grandparents for Children’s Rights, with support from the Hagedorn Foundation. Among the 22 recommendations from this summit, increasing access to information for all types of kinship foster care providers was recognized as critical in meeting the needs of these families. Engagement of all kinship care providers by the child welfare system was emphasized, as was the establishment of Kinship Navigator Programs in every state (CWLA National Kinship Care Advisory Committee and National Committee of Grandparents, 2012). Such programs link kinship providers with information about available support and services, including financial assistance, respite care, food and housing assistance, medical services, counseling services, and mentoring, training, education, and support group services. Some projects that have been designed and implemented in various states to serve informal kinship care providers are responding to the needs identified by the summit. Kinship navigator assistance is being provided in several forms, including websites, booklets, telephone calls, and in-person visits, by child welfare staff throughout the country. In some locales, special grant-funded projects that respond to additional needs have been implemented, such as respite, parenting assistance, mentoring, support groups, and community building among kinship caregivers. For example, the Washington County Department of Social Services (WCDSS) in Hagerstown, MD, offers information, referral and financial services, monthly support groups, and short-term case management services. Ligia Teodorovici, MSW, LGSW, kinship navigator for WCDSS, identifies herself as a supporter and advocate of informal kinship caregivers, which is an important element in the success of the program. “One of the things WCDSS’ Kinship Navigator Program has fostered is an outlet for informal kinship foster caregivers to come together through their monthly support groups, and they are becoming more empowered as they discuss ways to overcome their struggles and unique needs,” she says. Existing evidence-based approaches to enhancing foster parents’ effectiveness can be provided to informal kinship care providers. One model, Keeping Foster and Kinship Parents Trained and Supported (KEEP), was developed from work at the Oregon Social Learning Center and implemented in Maryland in the spring of 2010. The KEEP program consisted of 16 weekly 90-minute group meetings, weekly individual telephone consultations with participants, and in-home makeup sessions for participants who missed meetings. “We had active participation from our kinship providers, and our preliminary research findings suggest that our kinship participants had as many gains as our nonkinship participants; child problematic behaviors decreased and positive parenting practices increased,” says Elizabeth J. Greeno, PhD, LCSW-C, a research assistant professor at the University of Maryland in Baltimore. While these programs provide the types of services that address kinship caregiver needs, they are serving only a small percentage of informal kinship providers. Informal kinship caregivers across the country need assistance and services to ensure the children in their care flourish. Whether or not these providers are part of the formal child welfare system, they are essential elements of the foster care system. Social workers in a wide variety of roles can play a part in supporting kinship providers, especially informal ones. School social workers, medical social workers, mental health clinicians, and addiction specialists, who interact with children in both formal and informal kinship foster care, can make available services, such as kinship navigators, known to the families providing care. 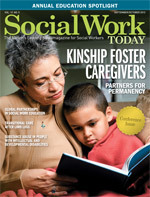 Social workers who encounter older adults providing kinship care can link these caregivers with the child welfare system and available resources, and staff from local public social services agencies can be instrumental in informing kinship care providers of services and assistance available through their agencies. Social workers, regardless of their fields of practice, can embrace informal kinship foster caregivers and serve as advocates for them and the children in their care. — Lynne Soine, DSW, MSW, LMSW, is an associate professor and the chair of the social work department at SUNY Plattsburgh. Child Welfare League of America. (2000). CWLA standards of excellence for kinship care services. Washington, DC: The League. Children’s Defense Fund. (2010). Fostering connections to success and increasing adoptions act summary. http://www.childrensdefense.org/child-research-data-publications/data/FCSIAA-detailed-summary.pdf. CWLA National Kinship Care Advisory Committee and National Committee of Grandparents for Children’s Rights. (2012). National kinship summit: a voice for the nation’s informal kinship care community. Washington, DC: Child Welfare League of America. Christenson, B., & McMurtry, J. (2009). A longitudinal evaluation of the preservice training and retention of kinship and nonkinship foster/adoptive families one and a half years after training. Child Welfare, 88(4), 5-22. Gibson, P., & Singh, S. (2010). Let’s help caregivers and children in informal kinship care: De facto custodian legislation. Child Welfare, 89(3), 79-97. KIDS COUNT. (2011). Grandchildren in the care of grandparents. Retrieved August 2013, from http://datacenter.kidscount.org/data/tables/108-grandchildren-in-the-care-of-grandparents?loc=1&loct=2 - ranking/1/any/true/867/any/434. Lorkovich, T. W., Piccola, T., Groza, V., Brindo, M. E., & Marks, J. (2004). Kinship care and permanence: Guiding principles for policy and practice. Families in Society, 85(2), 157-162. Raphel, S. (2008). Kinship care and the situation for grandparents. Journal of Child and Adolescent Psychiatric Nursing, 21(2), 118-120. Sakai, C., Lin, H., & Flores, G. (2011). Health outcomes and family services in kinship care: Analysis of a national sample of children in the child welfare system. Archives of Pediatric + Adolescent Medicine, 165(2), 159-165. Strozier, A., & Krisman, K. (2006). Capturing caregiver data: An examination of kinship care custodial arrangements. Children and Youth Services Review, 29(2007), 226-246.